All Seasons River Inn - Leavenworth Bed and Breakfast "
All Seasons River Inn is in a beautiful location on the Wenatchee River about a mile from the quaint shops of downtown Leavenworth. From the moment you enter this homey, yet large bed and breakfast, you are greeted with gracious hospitality. The Inn appears to be a typical residential home, until you walk through the front door and are greeted by the hostess and the comfortable, beautifully appointed living room. This is a cozy spot to curl up and read a book while watching the Wenatchee River flow by. While the current owner has only owned the property since 2013, this bed and breakfast boasts many years of continuous operation and repeat annual and bi-annual visitors for at least ten years. In addition, one employee has remained there from the beginning of operation. Each of the six rooms is decorated in a pleasing blend of traditional furnishings and beautiful antiques. All are comfortable and have seating facing the river for those who prefer to read their book or visit with their travelling companion in seclusion. Included in each room is a fireplace, refrigerator, 2 person jetted tub and all except the ADA appointed room have either a patio or deck with chairs overlooking the river. There are 3 rooms on the lower level, the Serenity, Enchantment and Cascade and each feature a patio with chairs to enjoy the outdoors and the river. 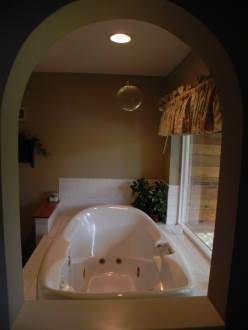 The Serenity and Enchantment each have a king bed and the Cascade has a queen bed. 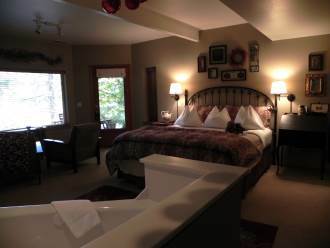 The upper floor has two rooms, the Evergreen and Riverbend, each with a king bed and a deck. In addition, there is a game/TV room (which includes a soda pop filled refrigerator) and another game room in a loft overlooking the main floor living room. The Riverview is an ADA room on the main floor with a queen bed and is located just off of the second dining room. 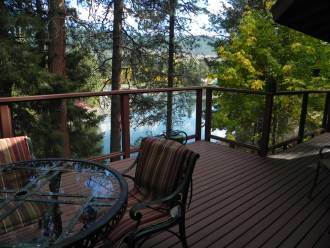 To view more images of All Seasons River Inn and other Leavenworth bed and breakfasts, click here. If you are in need of addition help decompressing, you will find an on-site licensed massage therapist. Tammy would love to provide a relaxing massage, a hot rock massage, a detoxifying herbal wrap or a healing massage for an additional fee. In addition to offering this service at All Seasons River Run, she has a facility in the town of Leavenworth, if you prefer. For additional information, her website is: www.crescentcreekmassage.com. Your hosts at All Season River Inn will cheerfully accommodate your dietary needs and typical breakfasts will consist of a gourmet meal of meat and eggs, and will also include a fruit dish and bread. A typical breakfast might be Baked Potato Casserole or Chile Relleno with homemade orange sausage and cantaloupe with a honey glaze for the fruit offering. Finally, one last touch, you will find enticing dishes of chocolates around both in the rooms and the common areas.  For rates and more information about All Seasons River Inn, visit their website. Do you own a Bed and Breakfast or other lodging? Advertise for free on North Cascades Adventures. Contact us for more information.